“Based on the twisted legend of Dr. Hunter S. Thompson,” claimed the ads, and that’s fairly accurate. The film is true to the myth Thompson created around himself, for better or worse. 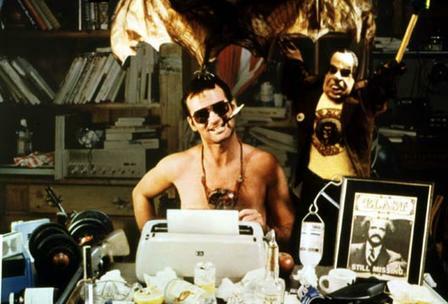 Trouble is, Where the Buffalo Roam has none of the brute force of HST’s great gonzo journalism. It’s just a ramshackle package of bizarre anecdotes, some only marginally connected to Thompson’s writings, others combining incidents from his stories. Each scene seems to begin with the question “Wouldn’t it be great if Hunter had done this or that?” So Hunter is shown meeting Nixon in a restroom (it was actually George McGovern). Bill Murray, who was cast as Thompson (and hung around with him as research, bringing some of Hunter’s personality back to the set of Saturday Night Live, much to his castmates’ annoyance), looks a bit like him and is occasionally funny. Too often, though, he comes off as Carl the crazed groundskeeper from Caddyshack, only with a typewriter. With him in the role, the movie looks like just another Bill Murray slob comedy from the pre-Stripes era, and the scenes taken from Thompson’s pieces seem like leftovers from SNL.